Who says you need a recreations room to play soccer? 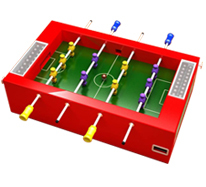 This table top soccer enables hours of fun. Challenge a friend...first one to score gets a treat. A miniature classic! Table top soccer is a highly competitive sport that requires fast reactions. Skittles table top soccer with BUILT in container. A new and innovative way for care providers to control treats and snacks given to children while occupying them with a game.